Israel got their 2019 judo season off to a strong start today, winning two golds from five events on day one of their home International Judo Federation (IJF) Grand Prix in Tel Aviv. At the first IJF World Tour event of the year they claimed victories in the women's under-48 kilograms and women's under-57kg divisions through Shira Rishony and Timna Nelson Levy respectively. At the event in the Shlomo Arena - which was announced by IJF President Marius Vizer following tensions at previous events between Israel and the United Arab Emirates - Rishony picked up her gold with victory over Ukraine's Maryna Cherniak. The 27-year-old, who was disqualified at the Rio 2016 Olympics for illegally touching her opponent's leg with her elbow, won by waza-ari after just 24 seconds. The bronze medals were taken by Brazil's Nathalia Brigida and Hungary's Eva Csernoviczki, who triumphed from the repechages. European bronze medallist Nelson Levy picked up her gold at under-57kg with a victory by waza-ari over Russia's Daria Mezhetskaia. The home judoka won with 50 seconds left on the clock, while Britain and Bulgaria won the bronze medals. Nekoda Smythe-Davis and Ivelina Ilieva gained their places on the podium with repechage wins over Helene Receveaux from France and Hedvig Karakas from Hungary respectively. 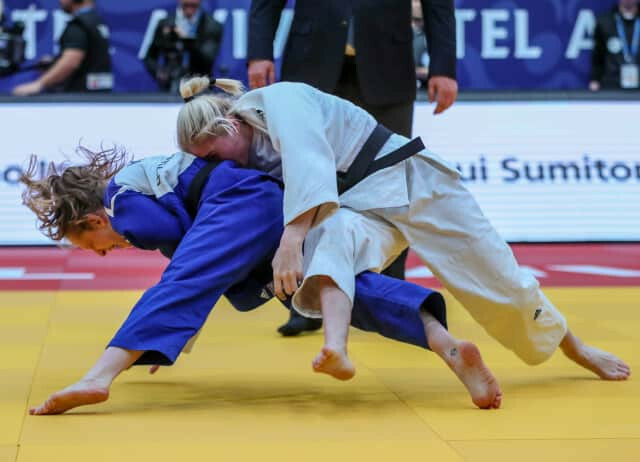 Israel also claimed a silver in the women's under-52kg division, but the day's three other gold medals were won by Jorre Verstraeten from Belgium, Italy's Manuel Lombardo and Kosovo's Olmypic champion Majlinda Kelmendi. Verstraeten won his first Grand Prix gold medal with victory in added time over Dutchman Tornike Tsjakadoea in the men's lightweight under-60kg division. His opponent was penalised after stepping out of the arena to receive a third penalty. Lombardo also picked up his first gold, which came with a waza-ari win over Ukraine's Bogdan Iadov in the men's under-66kg final. Rio 2016 champion Kelmendi seized her gold medal with a victory by ippon over Israel's Gili Cohen in the women's under-52kg class. The bronze medals in those divisions were taken by judokas from France, Russia, Spain, Romania and Switzerland. Russia claimed two in the men's under-66kg class and men's under-60kg division through Islam Khametov and Albert Oguzov respectively, while France's came from Cedric Revol in the men's under-60kg. Spain's bronze was won by Alberto Gairtero Martin at under-66kg, while Romania's and Switerland's were won by Andrea Chitu and Fabienne Kocher, both in the women's under-52kg. It all means that after the first day's action, Israel top the medals table with two golds and a silver. Italy, Kosovo and Belgium all sit equal second with one gold each. You can watch all the action here on Judo TV.